If you’ve walked through the Fringe grounds, chances are you’ve seen this piece. If you’ve walked through the Fringe grounds, you’ve seen it. If you’ve gone to the Old Strathcona Farmers’ Market, you’ve seen it. If you’ve just hung out in the Whyte Avenue area, you’ve seen it. Across the sidewalk from the sculpture, you will find a series of plaques that commemorate 25 Edmonton firefighters who died in the line of duty. Those names include Murray Clark and Ralph Hopp, who both died on what was one of the most tragic days in the history of Edmonton firefighting. Both were killed fighting a blaze at J.J. and Friends Discotheque on August 15, 1976. According to newspaper reports from that time, 85 people were evacuated after a fire in the club’s office burned out of control. The building could not be saved. The memorial also shows the cumulative dangers of firefighting. Of the 25 names, 19 died from cancer; all of these deaths were at least partially blamed to the smoke and other carcinogens inhaled by firefighters while on duty. 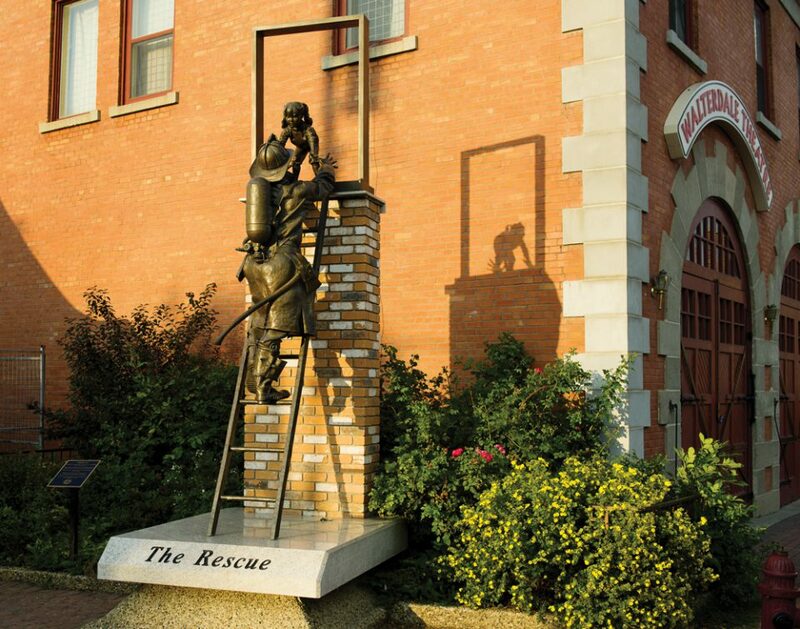 The statue is maintained by the Edmonton Firefighters Memorial Society, which was formed 20 years ago. Once a year, the Society organizes a memorial ceremony for fallen firefighters. The statue is part of a plaza that honours firefighters. The plaques are located nearby, as are a series of park benches that feature images of different fire engines throughout the years.